How Much Did Having Ryan Lindley At QB Cost The Arizona Cardinals? Arizona Cardinals quarterback Ryan Lindley scrambles away from the Carolina Panthers defense in his own end zone during Saturday’s NFL wild card game in Charlotte, North Carolina. The Arizona Cardinals won 11 games this year — the long-suffering franchise’s highest single-season win total since 1975. But Arizona went 2-4 down the stretch of the regular season, then were handled rather easily by the Carolina Panthers in a playoff contest where the Cardinals’ win probability broke 50 percent for just three plays. There was a certain injustice to a team like Arizona (the runner-up in what our Elo ratings consider far and away the best division in football), having to travel to Carolina for a playoff game against the Panthers, winners of one of the worst divisions in NFL history and only the second team ever to qualify for the playoffs with a losing record (excluding strike seasons). But the Cardinals also squandered their chances to avoid such a scenario during the regular season. However, starting quarterback Carson Palmer had also been lost for the season with a torn ACL in his left knee shortly before. And while Palmer’s understudy, Drew Stanton, played admirably in his stead, he, too, was sidelined indefinitely several games later. That left third-string quarterback Ryan Lindley to close out the team’s regular season in poor form, then post one of the worst QB performances in playoff history as the Cardinals lost in Carolina on Saturday. So, what might have been for the Cardinals had Palmer not been injured? They certainly might have fared better against Carolina with their No. 1 quarterback under center. Lindley’s -0.59 adjusted net yards per attempt (ANY/A) in Saturday’s game was 6.44 below that of Cam Newton, his counterpart on the Panthers, and there’s a definite relationship between ANY/A differential and winning football games. 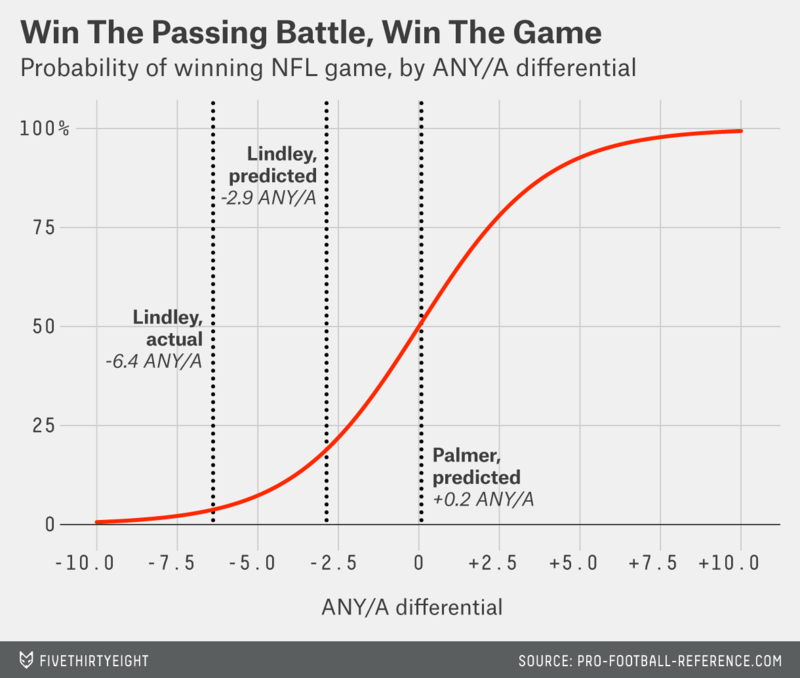 Based on a logistic regression model for all games since the league opened up the passing attack with major rule changes in 1978, there’s just a 3.7 percent chance that a team would have a -6.44 ANY/A differential in a game and somehow find a way to win. For Palmer’s part, his career ANY/A index is 104 (where average is 100, and every 15 units represents one standard deviation in performance), which would translate against the 2014 Panthers’ defense to an expected ANY/A of +0.23 relative to Newton’s performance. That differential would buy a team the win about 53 percent of the time. But in fairness, Saturday’s terrible game was something of an outlier for Lindley as well; although his career ANY/A index of 58 is rather ghastly, if he had even played to that norm, the Cardinals could expect to steal a win nearly 20 percent of the time. That means Palmer’s absence may have cost the team something like a third of a win. Back when Palmer was last healthy, Elo graded Arizona as the fourth-best team in football, with the league’s second-highest probability of winning the Super Bowl (narrowly trailing New England). But on the other hand, those Super Bowl chances were still just 19 percent at their peak, while the betting markets were nowhere near as high on the Cardinals as Elo was (largely because statistics say a chunk of their success was the product of unusually good luck). We’ll never know how high the Cardinals might have soared if not for their epic spate of QB injuries, though — and that’s a shame for a franchise that almost never has seasons as magical as 2014 was shaping up to be.